Scientology Marriage Counseling is a very powerful technique for restoring ARC between marital partners whose relationship has become strained or is headed for divorce. The length of time required to complete Scientology Marriage Counseling can vary, but ordinarily it can be done in one or two intensives. This processing must be done at an org which is qualified to deliver auditing to the partner with the highest case level. For instance, if one of the partners is OT III and the other is a Grade IV Release, the counseling may be delivered at an Advanced Org, but not in a Class IV Org or mission. Scientology Marriage Counseling is actually classified as an assist. It is meant to alleviate difficulties a couple are experiencing in their relationship with each other by helping them to unburden their accumulated overts and withholds. Unlike most other processes, this procedure is done with three people in the auditing room—the auditor and two preclears (the marital partners). 1. Set up the auditing room as per HCOB 4 Dec. 77R, CHECKLIST FOR SETTING UP SESSIONS AND AN E-METER. Be sure to provide comfortable chairs for both partners. 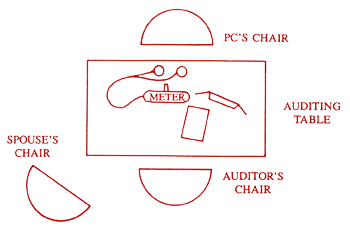 The chair used by the partner who is not holding the cans is placed to one side of the auditing table, facing the pc’s chair and slightly behind the auditor. a. Explain that everything said in the counseling you will be doing is held in strictest confidence, according to the traditional rules of pastor/parishioner confidentiality. b. Describe how the counseling will be done, i.e., that you will be asking a set of questions, called a “process,” of one partner until a certain result is reached, then asking the same questions of the other partner. Ensure it is understood by both partners that when one of them is holding the cans and answering your questions, the other is to remain quiet and just listen, no matter what is said and no matter how much he or she may want to comment. When you are finished directing your questions to one partner, the other will be given his or her turn. c. Briefly explain to both partners what the E-Meter is used for. For demonstration, do a “pinch test.” Explain to both partners that to show how the meter registers mental reactions, you will give the partner holding the cans a pinch. Do so. Then get that partner to think of the pinch (while still holding the cans), showing both partners the meter reaction. (Ref: The Book of E-Meter Drills, E-Meter Drill 5RB) Keep t his demonstration and explanation very simple. You can use the book Introducing the E-Meter to help handle any questions, but do not complicate this step unnecessarily. d. Explain what the word “floating needle” means and that a floating needle indicates that you have reached a good point in the process. Let both partners know you will indicate a floating needle when one occurs in the counseling. e. Explain that when you have finished a counseling session, you will take both partners to the Examiner. Explain that the Examiner will have the pc hold the E-Meter cans, that the pc may say anything he wishes, and that the Examiner will not say anything other than acknowledging and indicating a floating needle when one is present. f. Clear the words “moral code,” “overt act” and “withhold” with both partners, using the definitions sheet attached to this HCOB. 1. WHAT HAVE YOU DONE TO (spouse’s name)? 2. WHAT HAVE YOU WITHHELD FROM (spouse’s name)? 3. Put one of the partners on the meter, set the sensitivity for the pc, do a metabolism test and check to be sure the pc is well rested, has eaten and is not hungry. 5. Run the process commands alternately (1,2,1,2,1,2, etc.) until the pc has an F/N, cog and VGIs6 Indicate the F/N and give the pc the R-factor7 that you have finished directing the questions to him/her for now. 6. Have the second partner sit in the auditing chair holding the cans while the first partner sits in the third chair, observing. Start a new worksheet for the second partner. 7. Give the partner on the cans the R-factor that you’ll now be directing the same questions to him/her. Ask if he/she has any questions before you begin. Set the sensitivity, etc., as in step 3. 8. Repeat steps 5-7, each time running the process to an F/N, cog and VGIs for the partner on the meter. 9. When the minister ends a session, such as for a meal break or to end off for the day, both pcs are taken to the Examiner. When counseling is ended for the day, the minister should see that the couple is scheduled for their next counseling session. 10. Write up the counseling session using a separate Auditor’s Report Form and set of worksheets for each pc. In order to ensure that a complete record of the session exists in both pes’ folders, a photocopy of each partner’s work-sheets should be included with the original worksheets of the other when those are placed in the pc folder. (For example, the husband’s pc folder would contain the original worksheets of his sessions, plus a photocopy of the worksheets of the wife’s sessions.) Route the two folders to the C/S. By continuing the counseling a point should be reached where the TA has flattened out on both partners, and both are F/Ning, VGIs and in ARC with each other. That is the EP. The aim of Scientology Marriage Counseling is to assist marital partners in restoring affinity, reality and communication with each other. Many, many marriages at the brink of divorce have been successfully salvaged with the help of this processing. There is, however, no guarantee that a couple wishing to get a divorce will decide to remain married, and no minister or any org staff member should make any such promise or claim to anyone. If the counseling is completed standardly, the couple will have been unburdened of the overts and withholds affecting their relationship and will be in good communication with each other and better able to make rational decisions concerning their marriage. It may take several counseling sessions to reach the EP. A marriage that is in trouble is not something that is put together again in one night, because the number of overts and withholds usually takes a little longer to detail. Excellent auditor TRs9 are a must in delivering Scientology Marriage Counseling. The auditor should have a flawless command of TRs 0-4 and be an expert at Upper Indoc TRs10. Considerable upset can sometimes occur in a Scientology Marriage Counseling session, and the auditor must be able to handle it and control both partners smoothly and with high ARC. Scientology Marriage Counseling procedure is not changed when it is being done on an OT. The procedure is the same regardless of the case level of the pc or pre-OT. Only in doing repair of Scientology Marriage Counseling on an OT III or above is there any difference in procedure. In such a case an LCRE11 would be done following the technical rules for use of correction lists on OTs. Scientology Marriage Counseling is C/Sed as one would any metered assist processing, according to the HCOBs of the C/S Series. As the pcs may be very green, the C/S should be alert for any indicators that one or both of them do not understand what is expected and get this remedied if spotted. The C/S should also ensure that an auditor is thoroughly checked out and drilled before allowing him to do this processing. With the added randomity of two people to handle in each session and the misemotion that can sometimes come to the surface in this processing, it requires excellent auditor TRs, metering and command of the procedure. 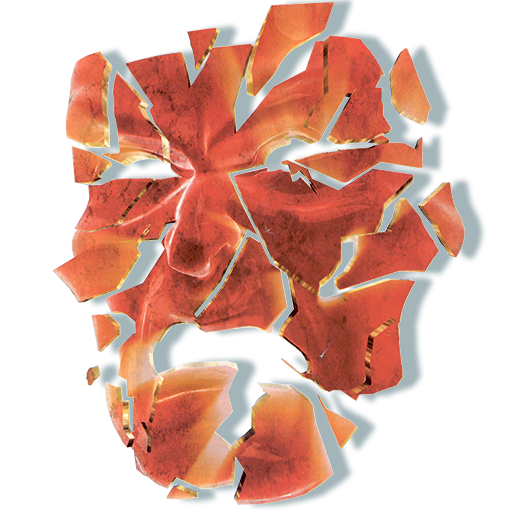 Ordinarily upsets or bogs in Scientology Marriage Counseling stem from missed withholds and are handled by simply continuing the process. However, if a session is utterly bogged or if a pc is refusing to go on at all, an LCRE should be assessed and handled. If an LCRE must be used, it should be done in a session without the pc’s spouse present; however, if overts or withholds on the spouse are gotten off in a pc’s repair session they must also be revealed by the pc to his spouse in a later session when the spouse is present. This is done by simply having the pc, in the next session, tell the spouse each of the overts or withholds that were gotten off in the repair session. If the auditor delivering the counseling is not qualified to use the LCRE, the pc is turned over to another auditor for the repair session. If one or both of the pes refuse to come in for a Scientology Marriage Counseling session after counseling has begun, arrangements should be made to get them in immediately for repair as above. Scientology Marriage Counseling procedure is quite simple. Guard against any tendency to complicate the procedure with additional commands or steps. One point of complexity that has been added to this action by some is in the area of setting up the pc for the action. Scientology Marriage Counseling is done as an assist for a present time difficulty. It is not a major grade or rundown requiring extensive setups before it can be done. Even rudiments are ordinarily unnecessary—if the pc is there for Scientology Marriage Counseling on his own determinism, he’ll be found to be in-session12 already; rudiments would act as a distraction in such a case and could tend to throw the pc out of session. (Ref: Tape 5911C09, “Demo of an Assist”) Unless it is known that a pc has a situation which must be handled before an assist is begun (such as a read on out-Int or out-lists) the counseling is simply begun and carried through to completion much as one would do any assist action. Where extensive setups have erroneously been entered into, it has commonly been found that the pc’s attention is primarily on his marital situation, and that is exactly what ends up being addressed in the “setup” auditing. This can even include overts and withholds on the pc’s spouse coming to light without the benefit of the spouse being present. If a rud needs to be flown on one or both of the partners, it should be done in session with both partners present, unless the partner needing the rud is OT III or above and the other partner is not. Ideally, both partners should be audited in the same counseling session or on the same day. Though it may not always be possible to do this, experience has shown it is definitely preferable to audit both partners in one day rather than auditing one on one day and one the next. If you end off a counseling session by auditing spouse A, begin the next session by auditing spouse B. Example: On Monday the husband is given an hour of processing, then the wife is given 45 minutes, then the husband is given an hour and finally the wife is given an hour and a half. Tuesday the session is begun by auditing the husband, and so on. It is very important that both partners actually take part in Scientology Marriage Counseling on their own determinism. If one of the partners is hesitant to enter into counseling, a Chaplain or FSM can and should enlighten him or her to bring about an understanding of how the counseling could help. However, if one or both of the partners is not in agreement with doing the processing or is will succeed; in fact, Scientology Marriage Counseling may not be sold or delivered in such circumstances. A person who did not sign up for this counseling on his or her own determinism is a troublesome source per HCO PL 27 Oct. 64R, POLICIES ON PHYSICAL HEALING, INSANITY AND SOURCES OF TROUBLE,13 and is to be handled per that policy. It may happen that partway through Scientology Marriage Counseling one or both of the partners originate that they have decided to get a divorce. Even if they seem to be satisfied with their decision, the counseling must be continued until the full EP is reached: TA flattened out on both partners, both F/Ning and VGIs and in ARC with each other. When a couple has completed Scientology Marriage Counseling, they must be sold and delivered training to hat them on basic Scientology and tools they can use to build a strong and lasting relationship. The How to Improve Your Marriage Course is a Scientology Life Improvement Course designed specifically for this purpose and is part of a standard marriage handling program. Following the How to Improve Your Marriage Course, the couple should also do the Success Through Communication Course. When applied standardly, Scientology Marriage Counseling is a tremendously effective tool that can be used to open the way to a happy and satisfying marriage for couples who want to repair and improve their relationship. The following definitions are for use in clearing these terms as part of Scientology Marriage Counseling. Moral Code: An agreed-upon code of conduct. Whenever people get together and operate as groups, they make agreements on codes of conduct regarding what is right and what is wrong, what is moral and what is immoral—in other words, what will be contributive to survival and what will be destructive of survival. This is a moral code—a series of agreements to which a person has subscribed to guarantee the survival of a group. It doesn’t matter what the size of the group is—whether it is a group of two people forming a marriage or a whole nation being formed—they enter into certain agreements. Overt Act: A harmful act or a transgression against the moral code of a group. When a person does something that is contrary to the moral code he has agreed to, or when he omits to do something that he should have done per that moral code, he has committed an overt act. An overt act violates what was agreed upon. Withhold: An unspoken, unannounced transgression against a moral code by which a person is bound. A withhold is, then, an overt act that a person committed that he or she is not talking about. Any withhold comes after an overt act. Hubbard, L. R. (1980, 23 July). Scientology Marriage Counseling. Technical Bulletins of Dianetics and Scientology (1991 ed., Vol. XIII, pp. 364-71). Los Angeles: Bridge Publications, Inc. It has been longstanding knowledge in Scientology that in the presence of overts and withholds no gains occur. An overt act is an act of omission or commission which does the least good for the least number of dynamics or the most harm to the greatest number of dynamics. Overts are the biggest reason a person restrains and withholds himself from action. Man is basically good. When people commit overts and then withhold them it is because they conceive that telling them would be another overt act. By withholding overt acts, these are kept afloat in the universe and are themselves, as withholds, entirely the cause of continued evil. A person who has overts and withholds becomes less able to influence his dynamics and falls out of communication with those people and things he has committed overts against. Writing up one’s overts and withholds offers a road out. By confronting the truth an individual can experience relief and a return of responsibility. The theory behind the action of writing up one’s overts and withholds is contained in the Scientology Axioms, published in their entirety in the book Scientology 0-8: The Book of Basics. 1: Stupidity is the unknownness of consideration. 2: Mechanical definition: Stupidity is the unknownness of time, place, form and event. 1: Truth is the exact consideration. 2: Truth is the exact time, place, form and event. Thus we see that failure to discover truth brings about stupidity. Thus we see that the discovery of truth would bring about an as-isness by actual experiment. Thus we see that an ultimate truth would have no time, place, form or event. Thus, then, we perceive that we can achieve a persistence only when we mask a truth. Lying is an alteration of time, place, event or form. Lying becomes alter-isness, becomes stupidity. Anything which persists must avoid as-isness. Thus, anything, to persist, must contain a lie. Writing up one’s overts and withholds can accomplish an as-isness and thereby relieve a person of the burden of his transgressions. When people do O/W write-ups, abuses can occur if the specifics of the action are not known and followed. The first step to be done before one undertakes the action of an O/W write-up is to word clear exactly how such write-ups are done. Experience has proven that people have run into trouble on O/W write-ups when the format (including the key words and terms) was not word cleared before embarking on the action. 1. Write down the exact overt of commission or omission. One has to get the time, place, form and event and one has to get a done or a failure in order to get as-isness. “1. I hit a friend’s car when backing out of my parking space at work and caused about five hundred dollars worth of damage to his car. 1. Write down the withhold. “1. I cheated on my wife (Sally) by seeing another woman and never told her about this. “2. Three years ago, when I was first married to Sally, I cheated on her by seeing another woman. I have never told Sally about this. One morning (in June 1985) I had told Sally I would take her to the movies that night and on my way home from work, when 1 was at Jones’ Department Store, I saw an old girlfriend of mine (Barbara). 1 asked Barbara to go out to dinner with me that night and she accepted. (She did not know that I was married.) I told her I would pick her up at 8:00 P.M. that night. When 1 got home from the store I told Sally 1 had to go back to work to get some things done and would not be able to go to the movies with her. The action of writing up one’s averts and withholds can be applied to anyone, and the breadth of its application is unlimited. A person is assigned a Danger condition and is instructed to write up his O/Ws per HCO PL 22 Mar. 85, Esto Series 51, FULL DANGER CONDITION HANDLING. A person wants to leave a course and the Ethics Officer has him write up his O/Ws. It could be that a person is nattering or feels critical, in which case the Ethics Officer or MAA could have the person write up his O/Ws. This is not to be construed as a rule that someone needs a C/S okay to get handled in Ethics. It simply means that the CIS and Ethics must be coordinated when handling a pc who needs to do an O/W write-up as fully covered in HCOB 13 Oct. 82, CIS Series 116, ETHICS AND THE C/S. In doing an O/W write-up a person writes up his overts and withholds until he is satisfied that they are complete. The person will feel very good about it and experience relief. One would not engage in carrying on an O/W write-up past this point. 0. The first action is for the person administering the O/W write-up to: (a) study and word clear this HCOB, (b) clear the words included in step 4 below, (c) word clear the O/W write-up format. 1. Get a qualified C/S to check the person’s pc folder to ensure that the person is not in the middle of a major case action such as lnt repair or List repair or in the middle of an incomplete listing action that would be interrupted by an O/W write-up. 2. Ensure that a space is provided where a person can write up his overts and withholds undistracted. 3. Provide paper and pen. 4. Have the person clear the following words in the Tech Dictionary: overt, withhold, motivator, justification, overt-motivator sequence. 5. Have the person read this HCO PL and word clear the O/W write-up format as covered above, to full understanding. 6. Have the person write up his O/Ws, exactly per the O/W write-up format above. This is done until the person is satisfied that he has written them up completely and he feels very good about it. 7. Get the person an end ruds check once the O/W write-up is complete. 8. See that the original copy of the O/W write-up is filed in the pc’s folder along with the worksheets of his end ruds check. Writing up one’s overts and withholds is a simple procedure that has unlimited application. O/W write-ups can bring about great relief and enable a person to achieve greater happiness.